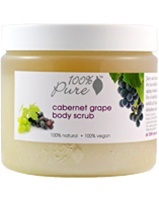 Delicious Cabernet Grape body scrub instantly makes your skin soft, smooth, healthy, glowing and vibrant. This Juicy and Invigorating Body Scrub smoothes away bumps and flakes for incredibly soft skin. Fruit Oils deeply moisturize while anti-aging vitamins and antioxidants nourish. Fruit Acids brighten gently for a healthy glow. Truly, 100% Pure- No Harsh Ingredients, no synthetic chemicals, no artificial fragrances or any other toxins that can strip, irritate or dehydrate your delicate skin.